Situated just off the Tapu-Coroglen road, the Square Kauri is one of the most well known and photographed trees of the Coromandel Peninsula. The "square" appearance of the bole seems to be due to compression wood flanges extending below the first branches, to well below the midway point of the 12.8 m bole. The tree has a spectacular crown, extending more than 30 m above the first branches. A full view of the tree is obtained further up the road from the start of the short and steep track leading to the viewing platform immediately adjacent to the tree. The view from the start of the track is somewhat foreshortened. 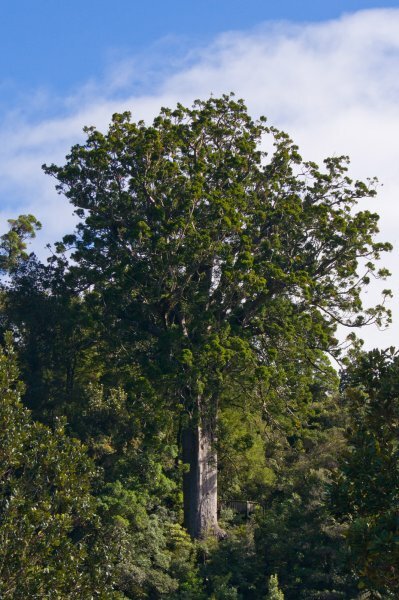 The girth of the tree was not directly measured, to protect the delicate shallow feeding roots of the kauri, to reduce the risk of contamination by Kauri die-back disease, and to avoid the fall risk on the eastern side of the tree. The girth (8.76 m) and diameter (2.78 m) measurement stated here are from measurements taken in 1975 and published by the Kauri 2000 Trust in their photographic survey of Coromandel Kauri, where the tree was ranked 21st in the region by merchantable volume (69.8 cubic metres) in 2002. Burstall gave a dbh of 12 ft (3.65 m) in 1972, later amended to 2.54 m in 1984. S. W. Burstall and E. V. Sale, Great Trees of New Zealand, 1984, pages 90 and 92. It appears to be in its prime. An exemplar of the species, even with the "square" bole. 18 Apr 2016 Smillie, M.J.
About 50 m in, and 50 m up from the road, 8.4 km from the turn off at Tapu. The short track is signposted. Footwear, etc. should be cleaned and disinfected to avoid the spread of Kauri die-back disease, as well as keeping to the track and viewing platform.